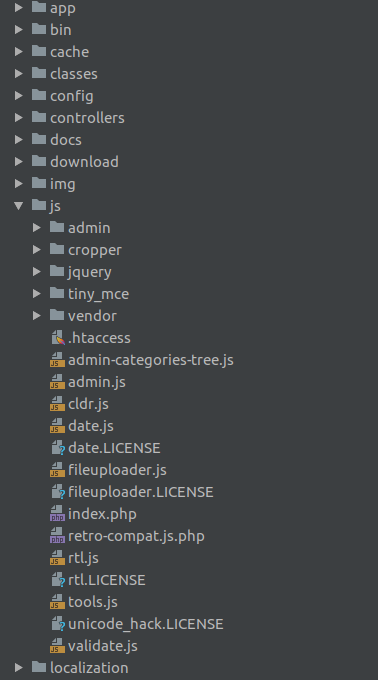 theme.js(/assets/js/theme.js) — bundles all theme specific code and libraries. clickQuickView — If your theme handles it, this event will be triggered when clicking on the quick view link. updateAddressForm — In the address form, some input will trigger ajax calls to modify the form (like country change), after the form is updated, this event is triggered. 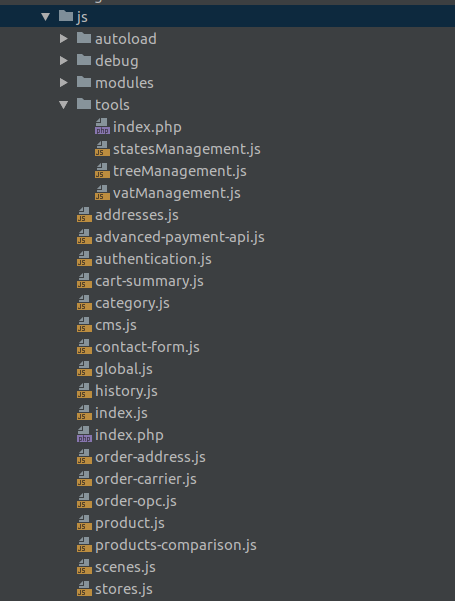 updateProduct — On the product page, selecting a new combination will reload the DOM via ajax calls. After the update, this event is fired. handleError — This event is fired after a fail of POST request. Have the eventType as the first parameter. updateFaces — On every product list page (category, search results, pricedrop and so on), the list is updated via ajax calls if you change filters or sorting options. Each time the facets is reloaded, this event is triggered. responsiveUpdate — While the browser is resized, this event is fired with a mobile parameter. updateCart — On the cart page, every time something happens (change quantity, remove a product and so on) the cart is reloaded by an ajax call. After the cart is updated, this event is triggered. updateDeliveryForm — During checkout, if the delivery address is modified, this event will be triggered. changeCheckoutStep — Each checkout step submission will fire this event. updateProductList — On every product list page (category, search results, pricedrop and so on), the list is updated via ajax calls if you change filters or sorting options. Each time the DOM is reloaded with new product list, this event is triggered.